Whoever it was that said “Money cannot buy happiness” probably never drove a Corvette. As I found out on my 25th birthday, money can buy a whole lot of things, including happiness. No, I didn’t buy myself a Corvette, but I did rent one for a day! After twenty-four years of ordinary birthday celebrations, I figured it was time for something different. Turning 25 is special because it is the age at which you can rent a car and not pay any underage driver fees. For that reason, I decided to look around and see what types of cars I could rent for my birthday. 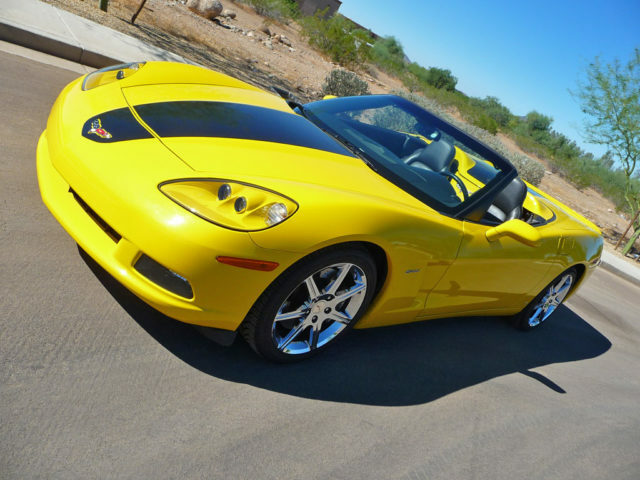 While browsing the Hertz website, I came across the “Fun Collection” and its crown jewel, the Chevrolet Corvette ZHZ. It was then that I knew what car I wanted to rent! 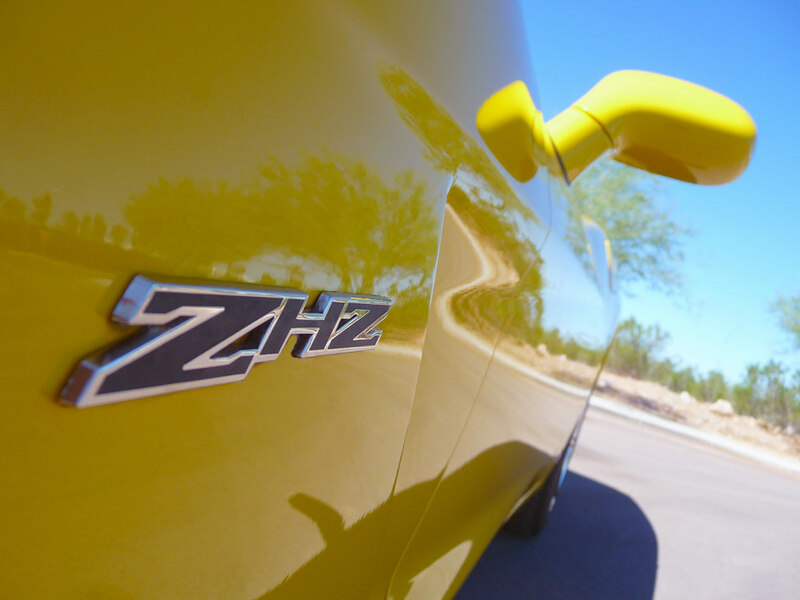 The Corvette ZHZ is a special-edition trim level which was produced exclusively for the Hertz Corporation. A limited run of 500 hardtop coupes were produced in 2008, with another 350 convertible models being produced in 2009. 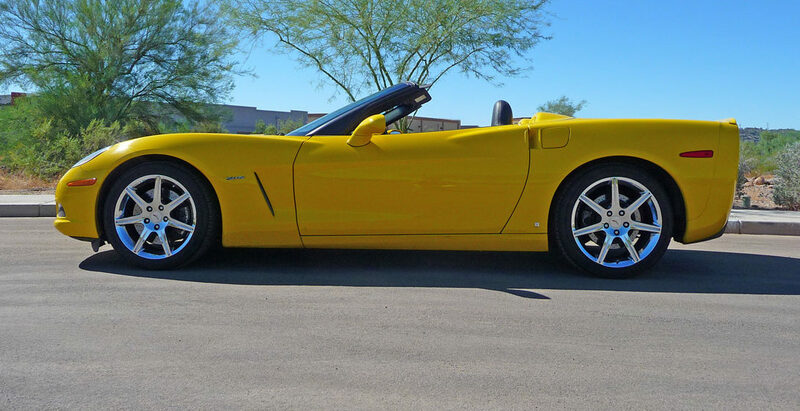 Each Corvette ZHZ is only available with bright yellow paint and a signature black stripe. No other color options are available. Each car is essentially a base model Corvette with a few notable differences. A vacuum-actuated exhaust raises the power output of the 6.2L aluminum LS3 V8 to 436 horsepower, 6 more than a standard Corvette. On the outside, the car features exaggerated front fenders which are more bulbous than on the base model. 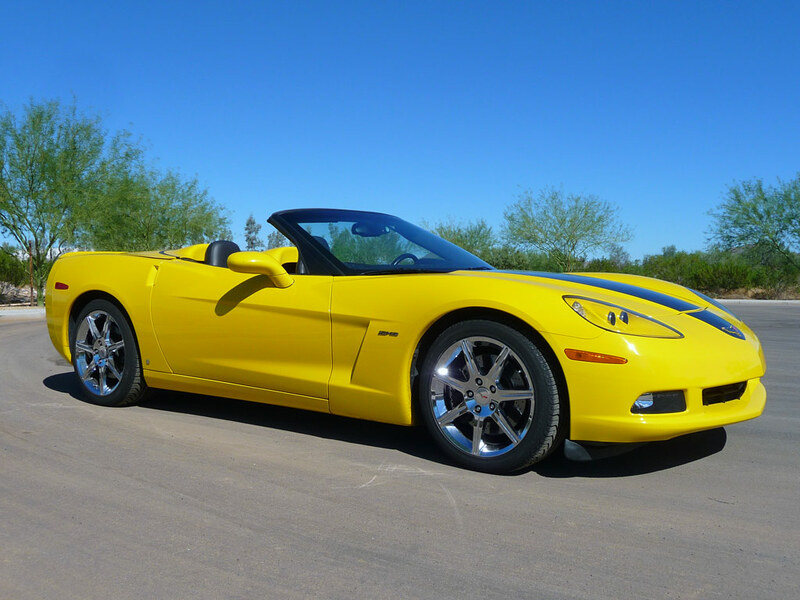 To top it all off, Hertz also equipped each Corvette ZHZ with Sirius Satellite Radio and their “NeverLost” navigation system. 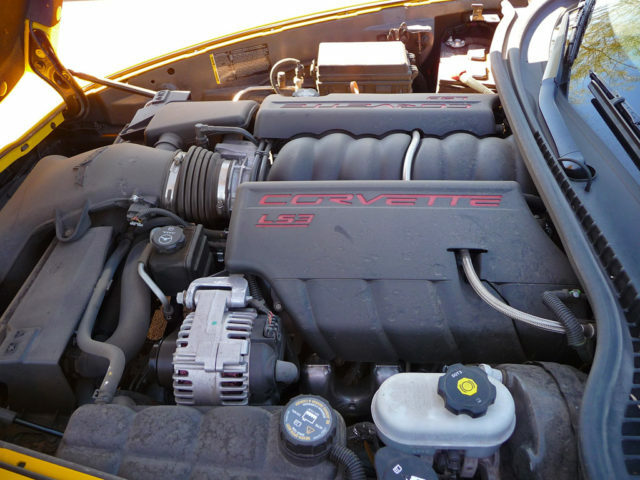 The 6.2L LS3 powerplant is the heart of the C6 Corvette. Apart from that, the car includes the Corvette’s usual Magnetic Ride Control and large 4-wheel disc brakes with cross-drilled rotors. An interesting upgrade was the six-speed automatic transmission with paddle shifters on the steering column. About four months before my birthday, I reserved the Corvette ZHZ through the Hertz website for the last Saturday in October. Picking up the car would be a challenge because I wanted to keep it a secret from my friends and family, and because of the location of the Hertz facility. Phoenix Sky Harbor Airport no longer rents cars directly at the airport. Instead, visitors must ride a free shuttle bus to a massive rental car facility that is several blocks away from the airport. After some thought, I came up with a plan that would allow me to rent the car without letting anyone know. 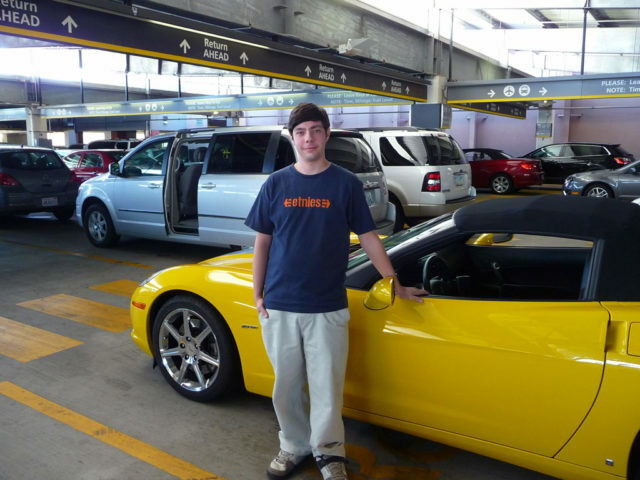 What I did was park my regular car in the long-term economy parking garage at the airport. From there, I took the free shuttle to the main terminal where I rode a second shuttle to the rental car facility. When the big day came, the plan worked and I stood in line at the Hertz counter trembling with excitement. I handed the clerk my reservation number and she wished me a happy birthday. Then, her face fell as she said “We don’t have any Corvettes right now.” I couldn’t believe what I was hearing! I had reserved the car four months in advance, how could they not have any cars available?! She apologized profusely and offered me the Chevrolet Camaro instead, but that wasn’t at all what I wanted. The clerk informed me that a car rented yesterday was due back in about three hours, but I really didn’t feel like spending my birthday waiting around in the rental car facility. She went into the back to speak to the manager and was gone for quite some time. When she came back, she said there was one Corvette but it was in the shop because of a problem with the convertible top. Apparently the last customer had attempted to put it down while driving on the highway and had broken it. “You tell me, is it rentable or not?” I asked her. She spoke with the shop manager again, and the two of them determined that the car was safe to take out. For my trouble of waiting in line for so long and for not having my car ready at the reserved time, the Hertz clerk upgraded me to unlimited mileage for the day. I had already planned on going over the 100-mile per day limit and simply paying the additional fees, and this greatly put my mind at ease! I signed the papers and headed downstairs to the garage where they would bring the car around. My fingers drummed nervously on the stack of papers in my hand as I sat on the bench in the Customer Loading Zone. A few moments later, I heard a rumble in the distance. A bright yellow car pulled up to the curb and a man got out with the engine still running. “This for you?” he asked. “Yep, that’s me” I replied. We did a quick walk-around of the car and he showed me how to wrestle with the convertible top to get it closed. A tingle of excitement shot down my spine as I slid into the driver’s seat and closed the door. After adjusting the mirrors and fastening my seat belt, I put the car in gear and headed towards the garage exit, pressing the accelerator pedal with a feather’s touch. A lady in a booth scanned a bar code on the car’s door jamb, and I was on my way. It was hard to stop smiling as I pulled on to the main road. I was driving a freaking Corvette! The first thing I did was jump on the freeway and head back up to my part of town. 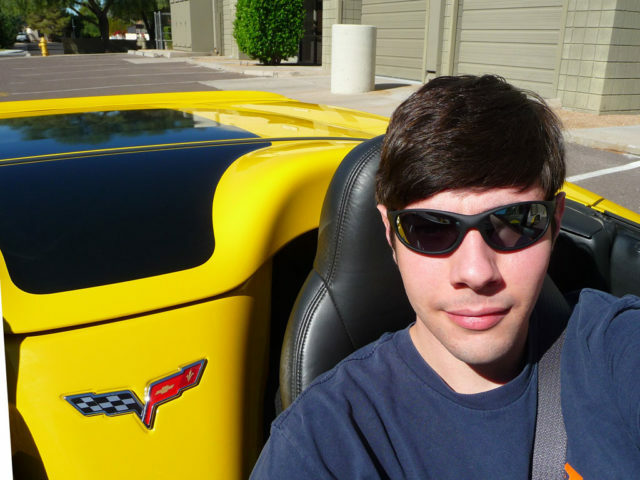 The weather was clear and sunny with a high of 80 degrees, and with the top down it was just about perfect! Everything about the car was exciting. It was wide, long, and very low. It had an electronic keyfob and push-button start instead of a traditional key. The radio controls mounted on the steering wheel were extremely easy to get used to. The air conditioner blew like an arctic storm. And oh, that sound when you put your foot down! It was incredible. After a quick photo shoot with the car, it was time to go visit some friends. For the rest of the day, I dropped by various friends’ houses to show off the car. Everyone wanted to go for a ride and the response was overwhelmingly positive! People loved the excitement of being in a powerful sports car. I was just enjoying driving it! I spent about 15 hours behind the wheel and racked up about 300 miles of driving. Even driving like a maniac and constantly flooring it, I still averaged close to 30 miles per gallon! That alone is a testament to the Corvette’s incredible aerodynamics and engineering. However, not everything was perfect. 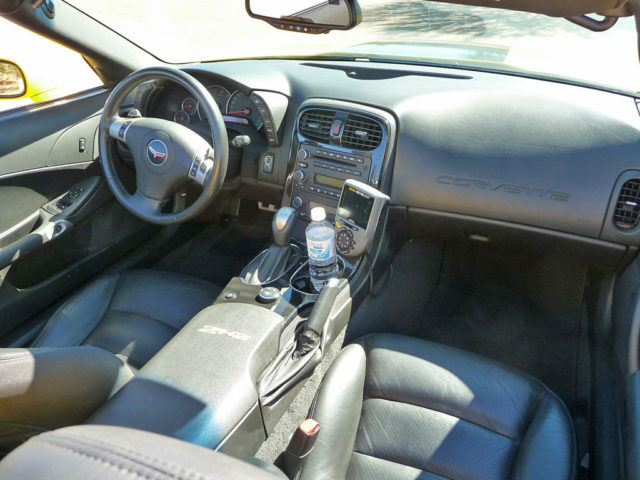 A knob on the center console had two settings for the Magnetic Ride Control: Sport and Touring. So far as I could tell, the knob did nothing. I felt absolutely no difference in the car’s handling one way or the other. Besides the suspension controls, I also did not use the Sirius Satellite Radio or the Hertz navigation device. It was a bit of work to wrestle with the broken power-assisted folding top, but when closed it offered a very quiet and normal ride with no wind noise. It was easy to imagine myself driving the car every day, until I found a copy of the window sticker in the glove compartment. The retail price of the car was $51,000 dollars! Eventually, the time came when I had to return the car to Hertz. 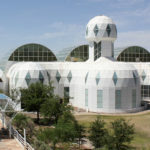 They offer a 30-minute grace period before you are charged for a second full-day rental. This grace period ended up being a blessing because there were no gas stations close by the rental car facility to fill up, and it took a few minutes to find one. Returning the Corvette to Hertz at the airport in 2010. The car itself was just $110/day to rent, but with all of the various fees, insurance, and taxes, the total came to $216.43. Plus, there was another $39.15 it cost me to fill the car up before returning it, and the $22 fee for leaving my regular car in the airport parking garage. That brought the grand total for everything to $277.58. That may seem like a lot, but since I will probably never be able to afford to buy one, it was worth it to me. My joyride lasted just 24 hours, but the memories of that day will last a lifetime. It was one of the best birthday presents ever, and if you have the chance I would highly recommend that you rent a Corvette for yourself! Here is a video I made of my day with the Corvette. Hope you enjoy it!